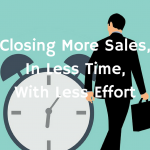 How long does it take to close a sale? How many times do you have to call on someone before they buy? How persistent do you have to be? When should you move on? I don’t know the answers to these questions, because every sales situation is different. But with better telephone techniques you can certainly do a better job of separating buyers from non-buyers, and by discovering a customer’s problem you can shorten the time it takes to close the sale. I started thinking about this subject because of an article that was forwarded to me by John, an avid reader of my newsletter. I know that most salespeople waste a lot of their time chasing prospects that never buy, so I wanted to learn more about this study. When was the study done? Who was the group conducting the study? How did they come to these conclusions? What kind of products/services were being sold? Were these experienced sales people or rookies? “Notice that only 19 percent of the sales were closed by the fourth call. The majority were closed during the fifth call. What is the salesperson doing – or saying – on the first, second, third, or tenth call? Who is the salesperson speaking with? Who are the decision influencers? What is the company’s decision making process? More importantly, what are the customer’s problems? Is this a problem they want to solve? What is the quantifiable cost of this problem? Higher costs? Lost productivity? Wasted time? Why is the salesperson’s solution the correct one? company instead of another supplier or vendor? They aren’t asking the right questions. They aren’t discovering the customer’s problems. Why wouldn’t they do business with you? That’s where the telephone comes in. When you’ve mastered the art of asking great questions – and know what answers you’re looking for – you can quickly discover whether or not your prospect has a problem. If they do, you’ll certainly schedule a meeting to discuss their situation further. If they don’t, put them away – and maybe call at a future time – and get on the phone to look for a better prospect. Calling on the same prospect over and over again – asking “Do you want to buy any Widgets?” – isn’t simply persistence. It’s the “I’m going to call on them till they buy or they die” sales methodology. In the end, the issue isn’t the number of sales calls it takes to close a sale, It’s the quality of the opportunities that you OPEN that will determine your success. Use the telephone more effectively and you’ll create more opportunities, spend more time with people who want to do business with you, close more sales, and become much more successful.